6 page workbook where students can match verbs to pictures. The pictures can be cut and pasted to match the verb. 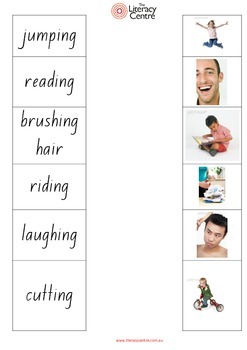 If the teacher cuts and laminates the pictures and verbs, it can be used for a variety of activities. Ideal for children who have english as a second language or for non vocal children who can read. The flash cards with photos can be used for receptive identification of verbs and can be used to evoke expressive language. The word flash cards can be used for receptive and expressive activities.